Basically, you can add your outlook.com account to any email client that supports POP3 or IMAP, like Microsoft Outlook Professional, Windows Mail, Android or iOS mail apps, etc. 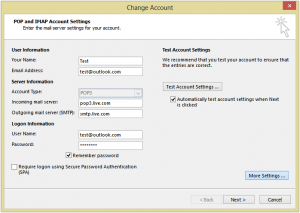 Depending on your email client application, you can add & configure your outlook.com email account as a POP3 account or as an ActiveSync / Exchange service. Later edit (13.09.2013): Microsoft added support for the Outlook.com IMAP email protocol, from 12th of September 2013. 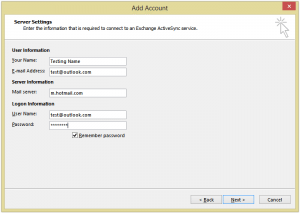 We will explain below how to add your outlook.com email account to Outlook 2013 – the mail server settings are the same for all email client applications, as long as they support the related email protocol (for example, ActiveSync is supported mainly by Microsoft products like Outlook 2013). Outgoing Server tab: mark the box “My outgoing server (SMTP) requires authentication” and select “use same settings as my incoming mail server”. Outgoing server (SMTP): port 587 – you must also choose “TLS” for the option “Use the following types of encrypted connection”. 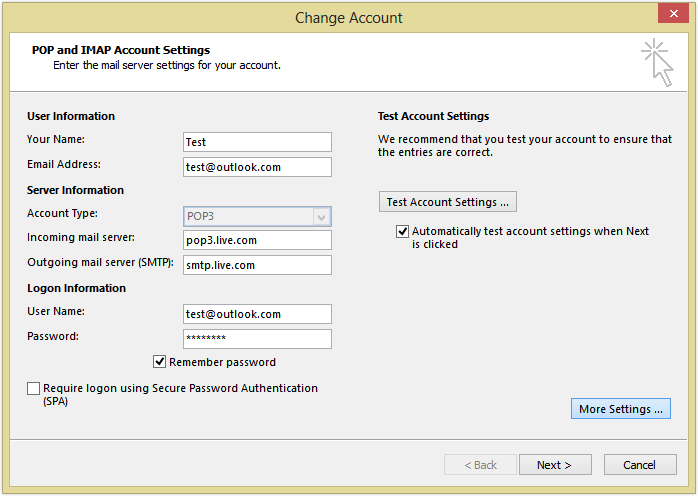 You can use the same Outlook.com POP server settings for any other email app, including iOS or Android Email apps. You have to follow exactly the same procedure as above, except that you need to select IMAP as your email account type (and not POP). You can use the same Outlook.com IMAP server settings for any other email app, including iOS or Android Email apps. Also, mark the box to use TSL/SSL for the server connection. 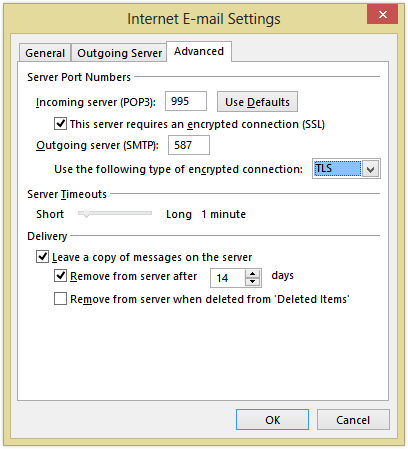 The Outlook.com mail server settings are valid for every email client application that supports the POP3, IMAP or Active Sync protocols, no matter the platform (Windows, Mac, iOS, Android, etc). We’ve updated the text to match the new ActiveSync server address. Thanks! I run Windows 8.1 & use outlook.com for my e mails. I also have Microsoft office 2013 installed & used to use Microsoft outlook for all my e mails. Since changing my ISP I am currently using outlook.com but would like to route outlook.com through my Microsoft outlook 2013 account but I cannot get it to work. I have tried all the suggested server settings above which appear relatively straight forward but with no success. What am I doing wrong? Hi, how do i find out my outlook domain details? One bit I did not see in the thread was about the next step to enable ActiveSync. Two way authentication has to be enabled. With the authenticator app on an MS phone. Download the app from the store onto the phone. Login into your MS master account from the browser. Make sure the MS mobile is associated with the account. Enable two way authentication. swap keys between the phone authenticator application and the browser. generate application passwords from the browser and update the phones MS account and outlook account. A password will also have to be generated for each device that sync’s to the account. im having a problem with our outlook here in the company. 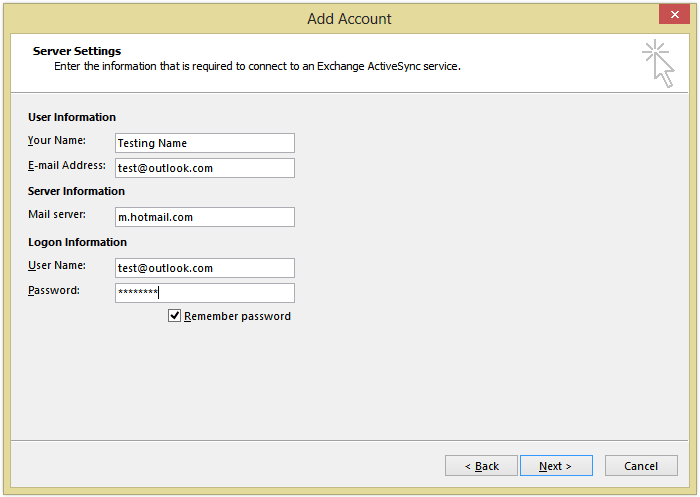 im a new here thats why i dont know how to create new account in outlook. how can i make a new one in the server? thank you. My Outlook is set up as IMAP, and emails I move to folders remain in my inbox, faded and with a line through them. How can I get these out of my inbox? This will quickly drive me crazy. 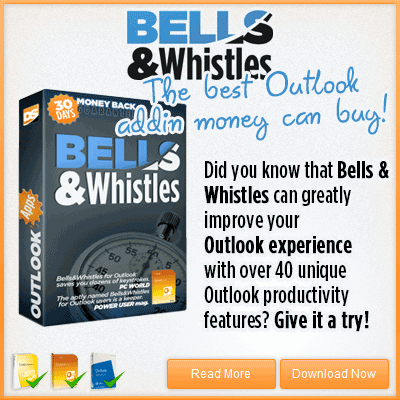 What if your email address is @live.com and not Outlook.com? 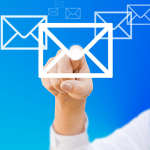 What are the imap settings for an @live.com email address? I tried with imap-mail.outlook.com and all the other settings but I get an error on the inbox saying to re download the folder list. I do so but still receive an error “Could not select ‘inbox’ on IMAP server. try uploading the folder list and try again. So I was hoping someone knows the @live.com server imap addresses, Ports and Security settings Thank you in advance for your help. Just switched our company email from POP to IMAP. Constantly getting message that it can’t sync or connect to the server. Other client apps work fine, but I would prefer to use Outlook. Thanks D:) If i use another smtp like sendgrid, mailchimp etc then how much can I send out per day with outlook..? I have 2 email accounts on outlook. For 1 account I cannot delete any emails. I get a message that the email has all ready been deleted. Other address does not have a problem deleting emails.